What a difference a few days or warmer weather and sunshine make? I really feel as though Spring has most definitely sprung. Seeing all the fab photos all over other’s blogs is really inspiring. One day I’ll sort out my camera and stop using my phone! We had a good weekend. I managed to get the supermarket out of the way very early (thanks BigR for the pre 5am wake up!) and we could spend the rest of the time having fun. 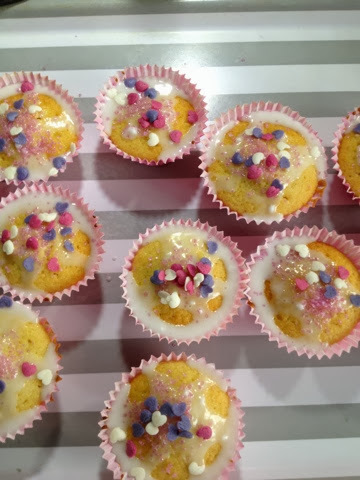 On Saturday whilst LittleR napped we made fairy cakes (or buns as my Yorkshire lass says) and some more date and ginger slices for Daddy. She was very excited to be using the pink cupcake cases. We planned to ice them but they hadn’t cooled enough before LittleR awoke, so one had to be taste tested before that happened for quality control purposes. We decorated them on Sunday…there can never be too much pink glitter. The lack of icing on the cakes is down to BigR not liking it! We used just enough to stick on the sprinkles! 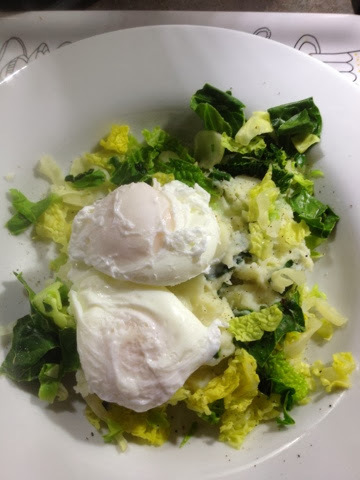 I was inspired by Gillian to make some poached eggs with Colcannon. Usually my poached eggs don’t cut the mustard. I was quite proud of these two holding their shape. I used a mixed bag of cabbage as I didn’t have any Kale in the fridge and lots of black pepper. It was very, very tasty! 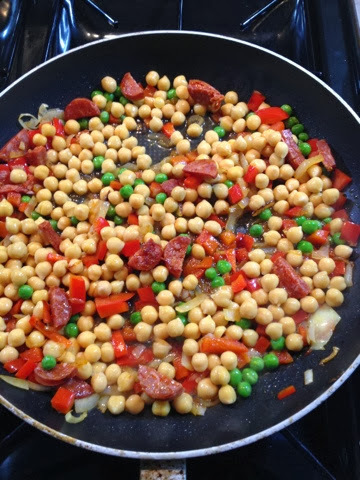 In keeping with my try a new recipe each month…for my evening meal, once the girls were in bed, I made Sue’s chorizo and chickpea rice. I forgot to take a picture of finished dish as I was far too hungry!! I used Chorizo from Tesco and found it to be a lot more piquant than others I have used. No less tasty for it though. There was enough left for lunch the next day which I had with a big salad. You can tell spring is here; I’ve bought salad! Also, this picture tells me I need to clean my pan handle more thoroughly! I’ve had to google whether you should capitalise ‘spring’ or not. Apparently if you give the word a human trait you add a capital letter….everyday really is a school day! Sunday saw playing with friends at their house due to inclement weather and the making of a Shepherd's pie and a beef casserole. Batch cooking at its best. All this food activity meant I spent a happy few hours leafing through some cookbooks. I have 2 huge shelves of cook books and can’t stop collecting them. I’m not sure how much of this changes what we cook day to day, sometimes I think just be having them there things will go in by diffusion! I have very practical books that I use regularly and plenty of fantasy books that I just read for pleasure (and look at the pictures for inspiration). This is what I perused over the weekend. The Allegra McEvedy book was a ‘getting paid for the second time after going back to work’ treat. It’s got some lovely looking recipes in it that I may even try out!! I like recipes that have a bit of narrative to them as well. Nigel Slater is a favourite cookery writer. He really understands how to marry together words and food. I’m loving the Rose Prince book too! The River Cottage bread book is a staple. We should have made homemade pizzas but we ran out of time! Once again I’m thinking about work and not working. It’s nice being paid and having that extra cash to buy books and glittery sprinkles, spending time having adult conversation and using my brain in non-childcare/household (read here cleaning) related tasks. I spent so long in education to get into the ivory tower of academia I’m loathe to give it up completely. Being an academic is part of my identity. A really important part of how I define me. So when I read this today I felt a mixture of relief that I wasn’t alone and despair. I earn a good salary but I’ve added up our childcare costs, how much it costs me to commute, and I have to conclude I’m not really in it for the money that’s left! I’m torn between caring for my children myself and having time as a family and being at work and perpetuating that part of my identity. Our School is in the middle of planning for an Athena Swan silver award, I’m part of the steering committee. It’s interesting as the leads are men, the loudest voices are men and they think they understand the pressures and that flexible working policies are the answer (mine could be a parking permit!). I guess it’ll be up to me to tell them where they’re going wrong! Hi, that's interesting about the whole childcare issue. I listened to You and Yours on Radio 4 at lunchtime today and they were discussing the costs of childcare (astronomical in some cases)... Had I not taken redundancy from the University, I may well have stayed put but doing temporary work when I got pregnant changed all that. As for the cookery stuff: I too love Nigel and his recipes. In fact I think we probably use his books more than any others. I'm also a sucker for beautiful books which I gaze at but don't actually use. Must remedy that sometime! 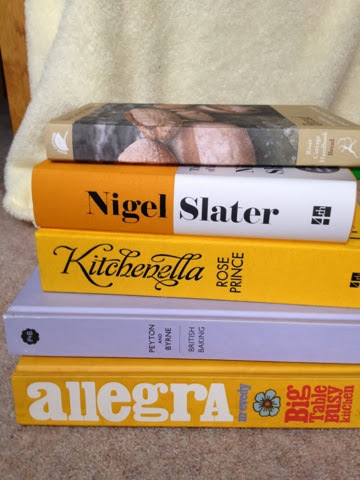 My plan is to cook something from all of my cookbooks...it could take me a looooooooong time....maybe that should be a challenge for the future?! How did you manage to stay away from the cakes until the following day? My boys would have snaffled up as soon as my back was turned! I thought Gillian's colcannon and poached egg looked yummy too. I am making it for lunch on Friday (I am a meal planner). I am no academic, but when I worked I found the juggle of work/family/home very difficult. In the end home and family won. I still miss my clients and I still miss counselling. But the money just didn't add up. In fact I quite often ended up out of pocket. It's a hard choice to make...ending up out of pcoket is not a working option though! How did your Friday lunch go? The cakes are very pretty. I've never eaten colcannon but I saw Gillian's too, and now I've seen yours, and I think I would like it. I've never worked since having my children and I have no idea whether I could manage it. I was a teacher before I had my children and I enjoyed it but I'm not sure I could do both well. I think you've hot the nail on the head. I'm struggling to do both things well (I should've said that in my latest post). I think I need to delegate more! A year after I had my twins I went to work half time, more for my sanity than money. It felt like a constant balancing act, particulary when I did a uni course as well. For the last year I haven't worked as we moved abroad with my husband's work. I missed my work like crazy for the first six months but have adjusted to life without it and the increased time I have. 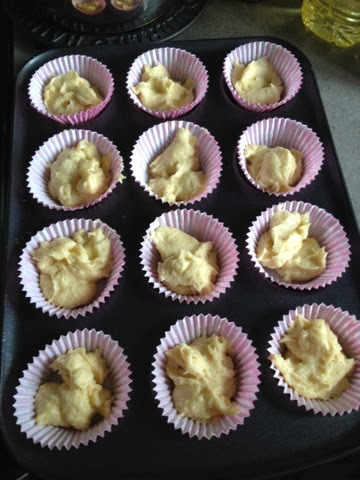 Love the cakes... and to get your poached eggs a perfect shape, line a cup with cling film, crack egg into it and then twist top and lift out of cup into your pan of water, it works like a dream, perfect round unbroken poached eggs! This was told me by a friend, who once dropped in when it was my lunch time and I offered her to join me for my simple fare... I wondered if she thought my poached egg I served her looked so bad.. it was a bit flaky on the edges of the white so I guess it wasn't the best of poached eggs!! That is an excellent tip! I will definitely have to try it! Thanks for visiting! So glad you enjoyed the eggs (yours look excellent by the way!) and that recipe idea originally came from Sue at The Quince Tree. I think I'm looking for better balance. I feel a bit out of kilter at the moment and I think it'll be harder when BigR goes to school (in Sept) and I'd be doing 2 drop offs and/or pick ups. I'm hoping when I've/we've come to a decision the powers that be say yes! !